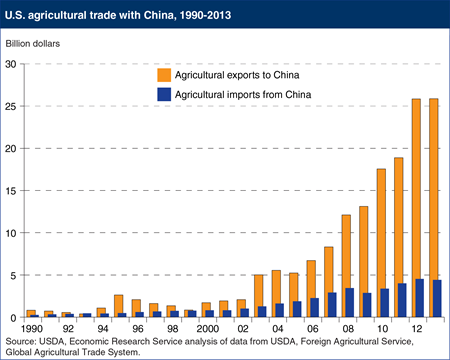 In recent years, growth in U.S.-China agricultural trade has accelerated. During calendar years 2012-13, U.S. exports of agricultural products to China averaged $25.9 billion per year -a tenfold increase from the late 1990s. Sales to China doubled during 2004-08 and doubled again during 2008-12, while the share of U.S. agricultural exports going to China rose from about 3 percent during the 1990s to 18 percent during 2012-13. China became the largest overseas market for U.S. farm products in 2010.